Shop Oliso online at Oliso.com for innovativeness of design that makes life simpler, that surprises us with straightforward functionality and delights us with useful, special features. 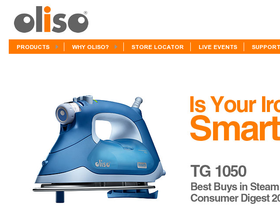 Oliso designed a steam iron that levitates, and a food vacuum sealer that keeps foods fresher for much longer. Check back often at 58Coupons.com for the latest Oliso coupons, Oliso promotions and Oliso savings for Oliso.com. Enjoy free shipping from Oliso.com when you spend over $50. Oliso's patented technology allows you to keep your food fresher than ever with the Frisper Freshkeeper. Vacuum-tight reusable bags store your food safely so you can enjoy it for longer. All of your products from Oliso.com come with a standard one year warranty, so any problems you might have will be made right. When you invest in a Smart Iron from Oliso.com, you're ensuring that the mundane tasks of making sure your cloths are presentable, become fun!